Looking at objects in a different way– in this case upside down– can help you create unusual container gardens. Bonnie Bagwell flipped a glass light shade and used it as the base for this eye-catching container garden. 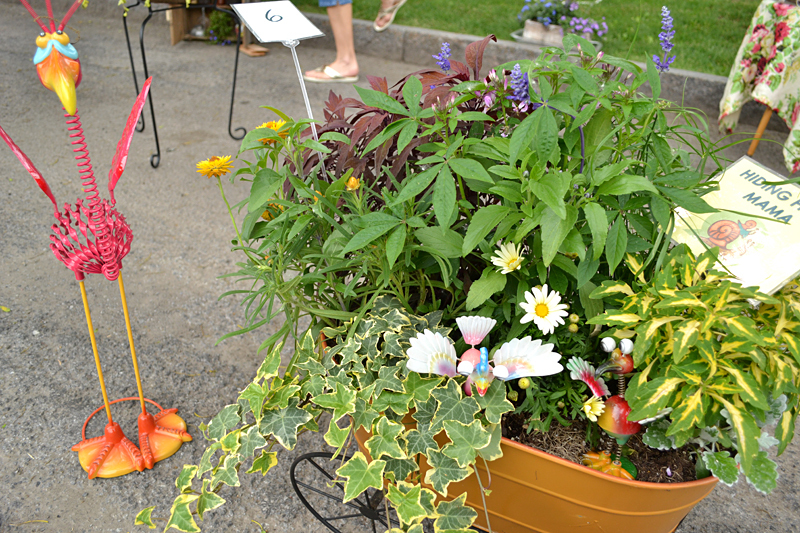 Bagwell won first place for her design in the traditional category of the container garden competition at the Lewiston GardenFest, which was held Saturday and Sunday, June 22 and 23. The event also included a vendor fair, garden walk and speakers. 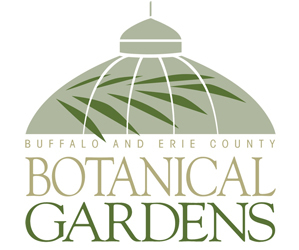 The event is sponsored by the Lewiston Garden Club, which is looking for new members. The club is going to hold some evening meetings to make it more convenient for those who can’t attend during the day. Club activities include speakers, field trips, social events and decorating in the Village of Lewiston. 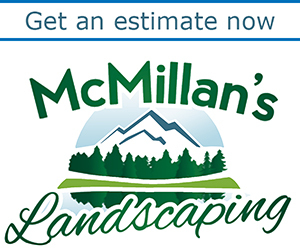 For more information on the Lewiston Garden Club, contact Sharon Low, president, at 297-5925. 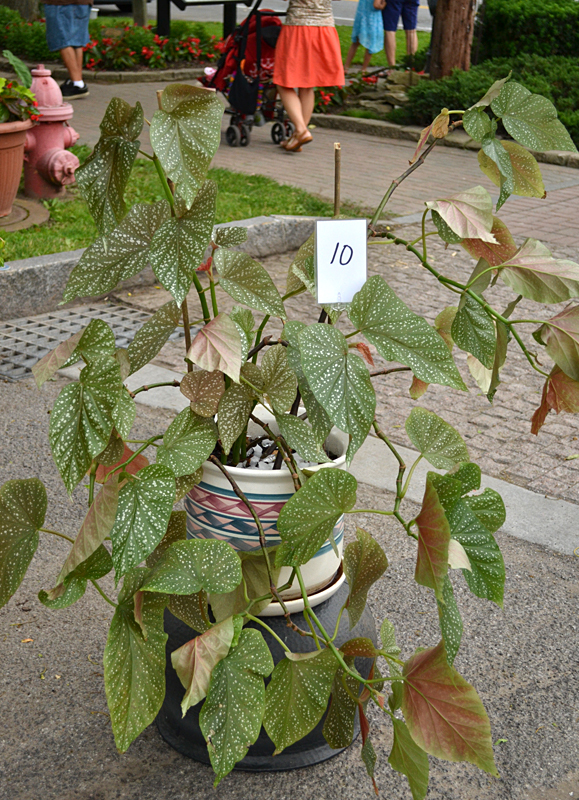 The container garden contest included 13 entries. 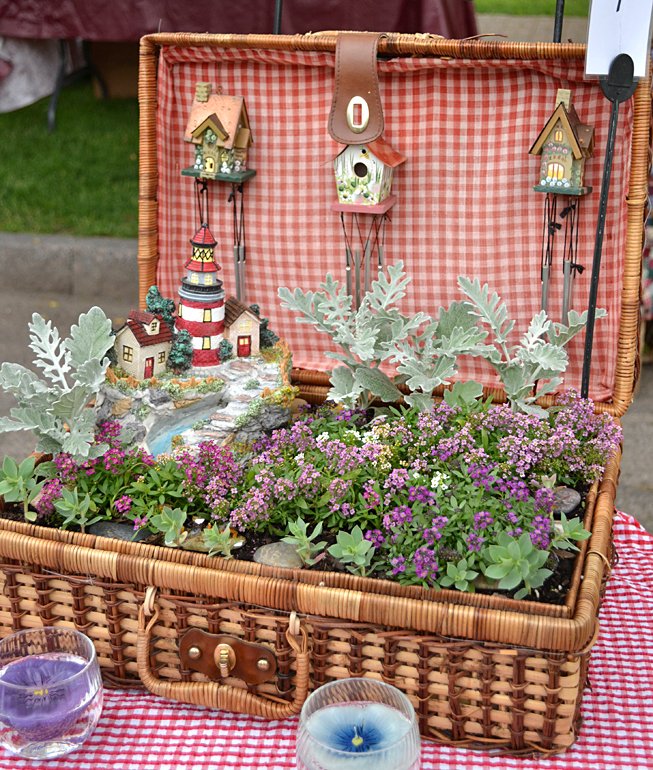 About 500 people at the GardenFest voted for their favorite, and winners were announced in two categories: traditional and whimsical. Take a look at all the entries below and get ideas so you can enter your container garden next year. There are no flowers at all in this simple but colorful garden arranged in a hypertufa container by Barbara Stafford, which won second place in the traditional category. 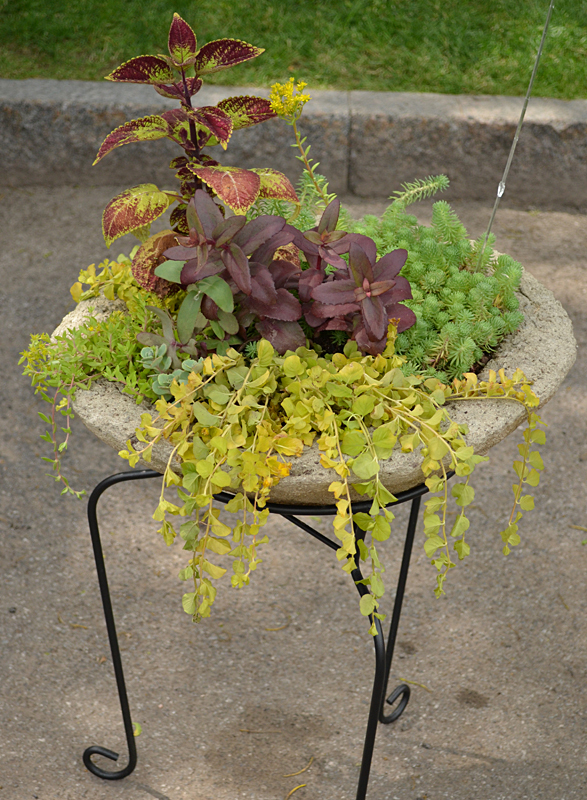 Coleus, succulents and other foliage plants combine to provide interesting hues and textures. 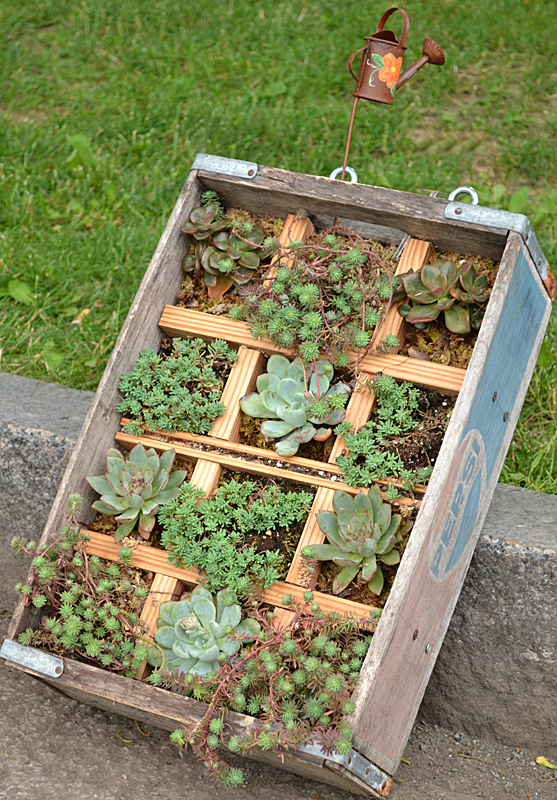 A wooden soda pop crate holds succulents in this container garden that can be hung on a fence or garage wall to provide interest at eye level in your yard. The succulents don’t have to be watered as often as other plants do. BarbaraCarter tied for third in the traditional category. 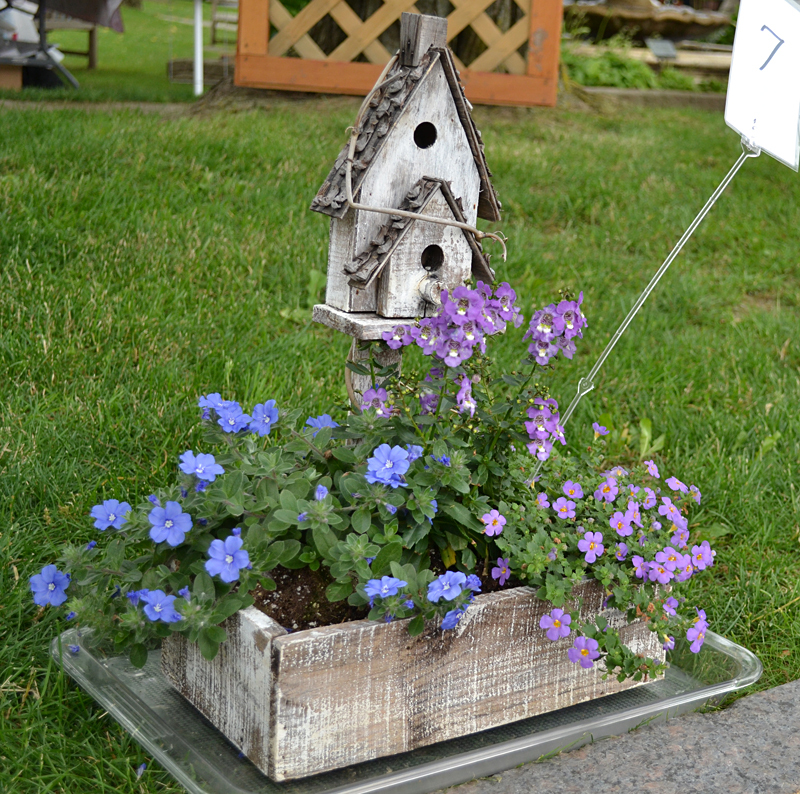 A bird house, blue flowers and purple flowers are the primary components of this simple and attractive container garden design. Charlotte House tied for third place in the traditional category for her entry. 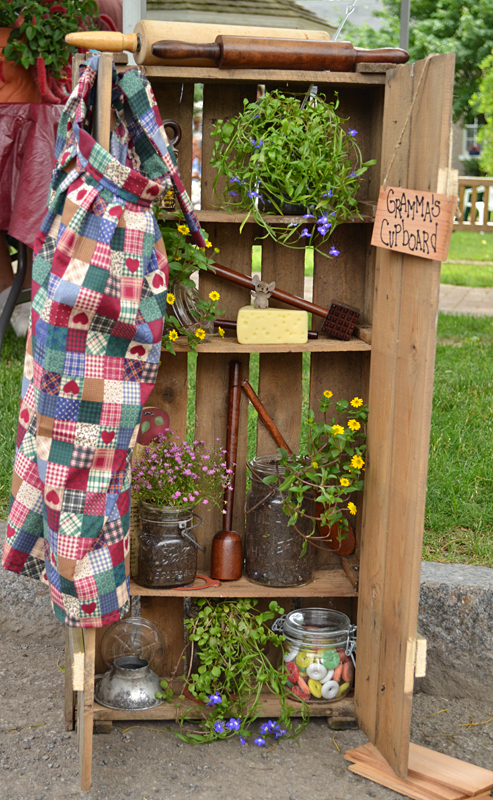 Canning jars hold potted flowers in “Grandma’s cupboard.” Rolling pins, other kitchen utensils, a candy jar and a patchwork apron add to the theme. Sally Knize won first place in the whimsical category for her entry. A picnic basket provides a summery base for this container garden that includes low-growing alyssum flowers and tiny bird houses with wind chimes. Doreen Albee won second place in the whimsical category. 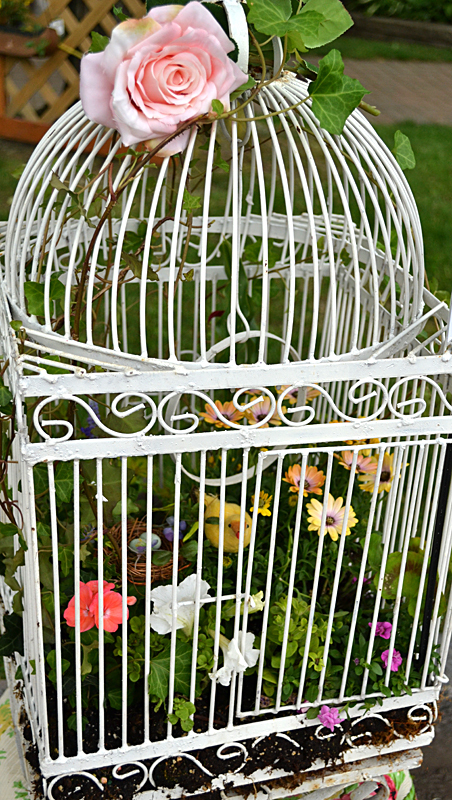 A bird cage is the clever container in this container garden. 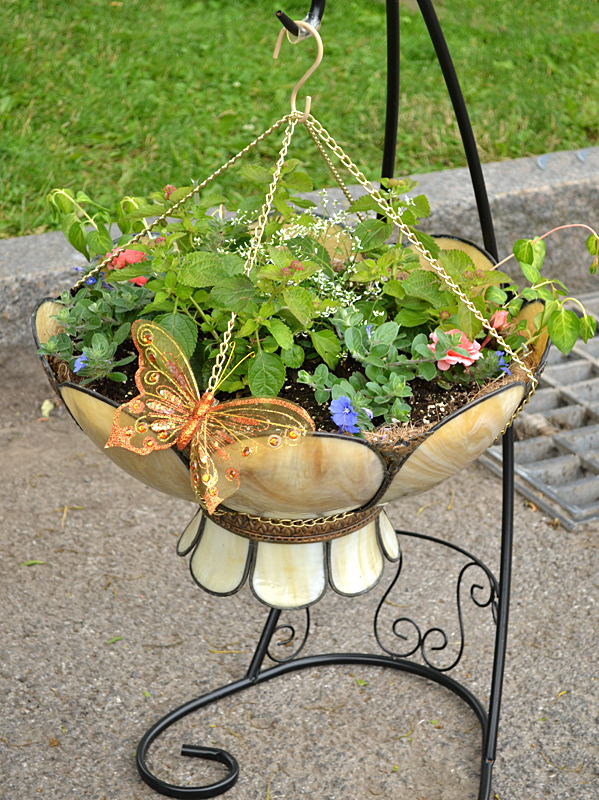 A decorative bird has its nest amid flowers, and a fresh rose and ivy embellish the outside of the container. Kim MacKenzie won third place in the whimsical category. A beach bag holds an assortment of plants, with some trailing out and over the top, in this entry by Bonnie Bagwell. 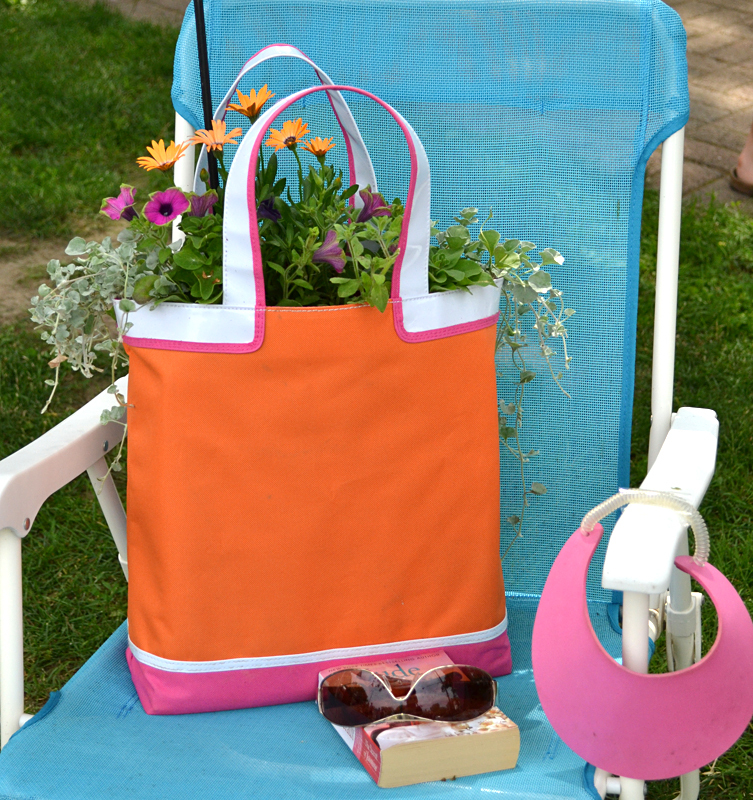 The bag was displayed on a colorful lawn chair with beach accessories. This design by Sharon Low tells a little story. If you look closely, you’ll see a red bird in the bottom right corner hiding from its mother, who is standing outside the garden. 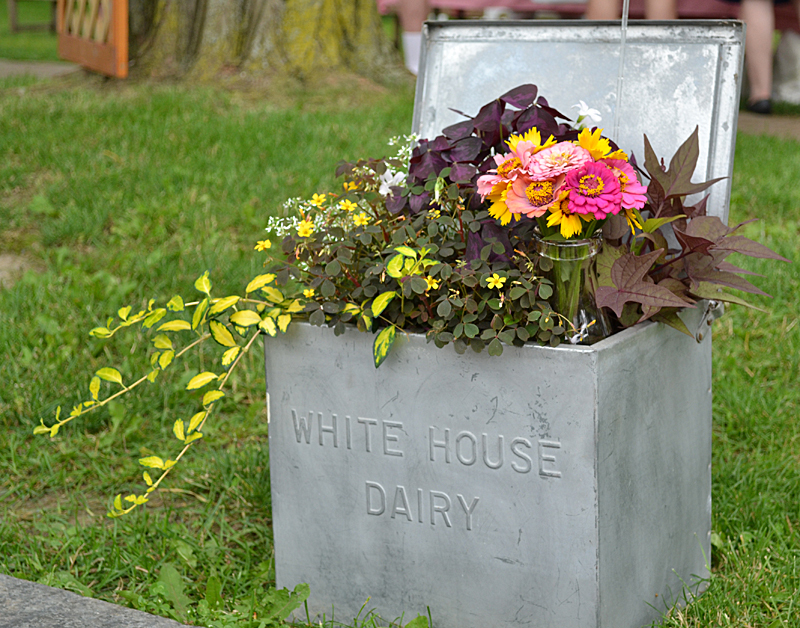 An old fashioned milk box, which once held bottles of milk that had been delivered to a home, makes a quaint container for this garden by Judy Munzi. Stretch the boundaries. Who says a container garden has to include just one container? 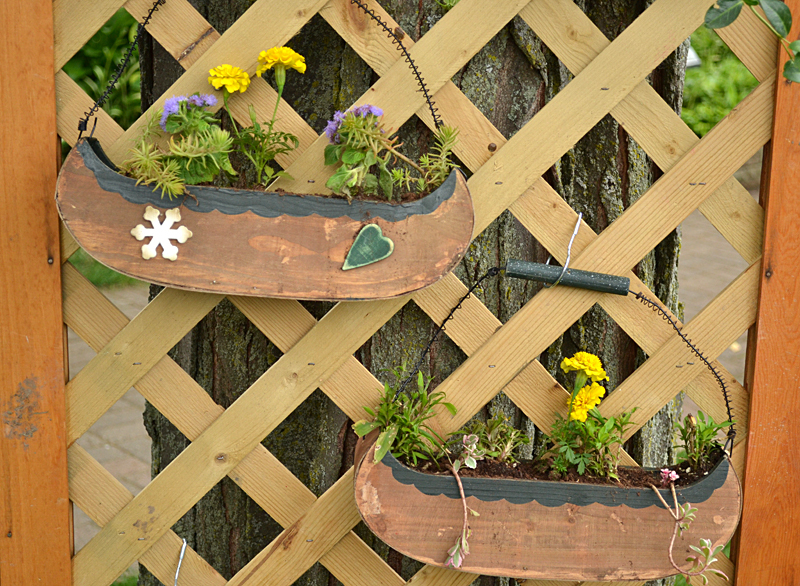 Five of these rustic canoe-shaped containers were displayed up and down a trellis in this entry by Kay Kalick. 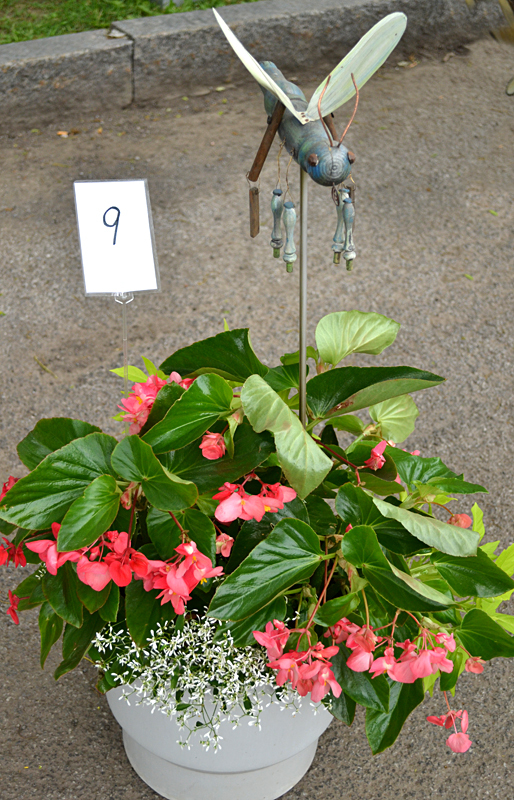 A dragon fly sculpture adds interest to this simple container by Barbara Landree. In this container garden by Jean Leckband, a single begonia is massive enough to call all the attention to itself. She created a slow watering system by placing ice cubes on top of the soil to keep it moist in the hot sun. Some very creative ideas. I am sad to have missed it this year. We have our ” Einstiens” in all sorts of fields, why not the creative world too? These are sooooo cool! The lamp shade is my fave.